For years, I've been using Google Drive as a quick and dirty way to convert dozens of Word files into PDFs with a few clicks (using this great tutorial as my guide). This saved me a lot of time in creating handouts for my students. However, in the new Google Drive, the option to bulk download your Google Docs files as PDFs is gone (instead, it just defaults to downloading them as Word files). You can still download Google Docs files as PDFs if you open them up individually -- but that's pretty time consuming if you have dozens of handouts to convert (as I do pretty much every semester). For awhile, I got around this by switching back to the "old" Google Drive whenever I wanted to do a conversion, but that option has now disappeared. There are other tools out there for bulk converting PDFs though, annoyingly, many of them (especially on Mac) don't retain hyperlinks. Thankfully, there's a workaround that allows you to still use Google Drive to do your batch conversions: Google Takeout. 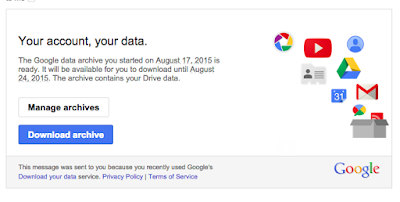 Google Takeout is a service offered by Google that lets you essentially download all of your data from Google services -- emails, photos, documents -- into one massive ZIP file. But you can also use it to do a batch conversion on a single folder of documents. First, check your Google Drive settings and make sure its set to convert uploads to Google Docs format (you can switch this back after). Now create a new folder in Google Drive (like "PDF Conversions") and upload all your Word files to that folder. If you want to convert files for multiple projects at the same time (like handouts for several different classes), just create subfolders within that one main folder. Go to Google Takeout. By default, everything will be selected for download. You don't want this (it will take hours). Click on "Select None" then scroll down to Google Drive and turn it on. Then, instead of downloading "all files and folders", choose "Select files and folders" and choose your "PDF Conversions" folder. Then make sure that the file format for documents is set to "PDF". Click Next. The defaults on the next page (ZIP file, email notification) are fine. Press Create archive. You'll get a little status bar showing you how the conversion is coming along but you don't have to sit there and wait. Close your browser and you'll get an email when it's all done (depending on how many files you have, this may take a few minutes). Click on the link and then download the archive. Open up the ZIP file and you should have all your PDFs -- with hyperlinks included -- inside. I've used this technique a few times -- including for dozens of Word files at a time -- and it seems to work great. The only minor bug I've noticed is that if your Word filename is longer than 90 characters (before the .docx), everything after 90 characters seems to get cut off. Hope this workaround saves some other folks out there some time. Just tried this and my zip file only contained Word files, no PDF. I tried doc files and docx, no luck. Still searching for an easy way to convert multiple Word files. i have same prob with you. It seems Takeout only converts Google Docs to PDFs. Most stuff in Drive is automatically a preview-only version with a (W) insignia, which you then have to open as a bonafide, editable Google Doc with the [=] square sheet insignia. 1. Change the settings in Drive so that uploads are converted to "Google Docs editor format." 2. Download my Drive folder onto my PC. 3. Re-upload these very same documents in another folder. This time they will be [=] "Google Docs." 4. Open Takeout and follow Skelton's instructions. Thanks for the tutorial, Skelton. PDF conversion's such a drag. If it didn't work, you didn't follow the directions. The key is to make sure that your word uploads get converted to the google docs format, and then you download them in PDF format using the takeout tool. Read the instructions, people. This works perfectly. Thanks so much for posting this! Very clever and super helpful right now! Thank you! This was very helpful! I followed the instructions. The resulting zip file had in it only files with .docx extensions. They are in fact PDF files but with the wrong extension. I can read them by manually changing their extensions, but that step negates any time savings by using your method. At first Skelton's Takeout method worked for me, and then today as Unknown says I, too, got "corrupt" files with the wrong extension. Re other Unknown (same Unknown? ), Cloud Convert costs $$ above a certain file limit (which I exceeded). Best solution, as far as I can tell, is PDF Mergy, which is an app for Google Drive, as shown here: https://www.youtube.com/watch?v=ZuxcnaAEDxI . It's free, easy peasy, and does the trick. Hope it works for you. The Cloud Convert extension to Google Drive does the batch conversion and gives each resulting file the correct PDF label. I wonder if there is a way to directly convert .html webpages into PDF files for download. My old laptop has trouble loading some web pages, (hack articles loaded with ads mostly) but no trouble at all to load a PDF file. this isnt working for me....when i open the archive, the documents are still in word? is there something basic that i could be doing wrong? I have followed every step several times and still received the same result? Drag, drop, reorder items from Google Drive as you wish, merge. Creates merged .pdf of whatever documents you throw at it from Google Drive. Fast and painless. Worked perfectly for me! Thanks chad! Keep up the good work! Upload the word document to Google Docs (before you do in Settings top right make sure you checkbox the conversion format to google doc from MS Word). I made a Google Doc and have different version of it. No matter what I have done, it still produces Word Documents.